What celebs were wearing at the Chanel fashion show in Paris! The Chanel Fashion Show presented at Pret-A-Porter was celebrity filled and they looked stunning. 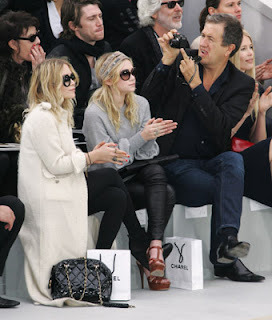 I have included pictures of Ashley Olsen, Mary-Kate Olsen, Mario Testino, Anna Wintour, Kanye West & Alexis Phifer and Rihanna. 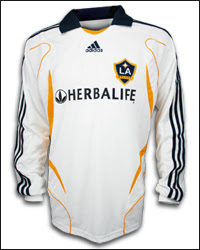 Check out their gear, it definitely makes a statement and induces trends. Okay gang, don't be mad at me because I am feeling A LOT of black and white for the Spring and I guess the industry is too!!! It is sooo much of it out there and Club Monaco has 2 spring looks that I am just cuckoo for cocoa puffs over. First some more good news, Club Monaco will be opening stores in Chicago, Massachusetts, Hawaii and Michigan this summer so fashion fans in those areas can take a hands on approach to looking at their apparel. LOOK 1 is priced at $348. Click here to purchase. 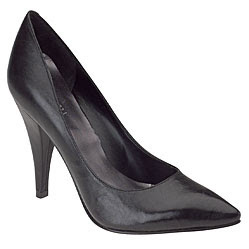 For a shoe, you can go with the Nine West Testino pump in black on SALE for $39.99. LOOK 2 is priced at $412. Click here to purchase. The same shoe can apply. **REMEMBER** These looks have several articles of Club Monaco's line with them and all of them are not necessary. Once you visit the site you may decide that you only want the dress without the cardigan or maybe you won't need the accessories. It is all up to you. My first post about the Billionaire Boys Club was back in December (click here for review) and now, it is time to pay homage again, in accordance with the N.E.R.D's crew recent television appearance. Pharrell and Nigo hang like wet clothes and reppin' the BBC in public is something that they must do. I have placed links within this post of where you can get some of the BBC apparel that Pharrell is ROCKIN', as for the shoes, they must be EXCLUSIVES!!! Billionaire Boys Club, if you're reading this, send me all of your exclusives and I will showcase them online and on the ground floor and make sure it gets across to THOUSANDS then MILLIONS!!! The BBC pants, cap, and jacket can all be found on their website. 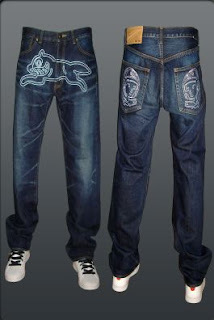 The pants are priced at $400.00. 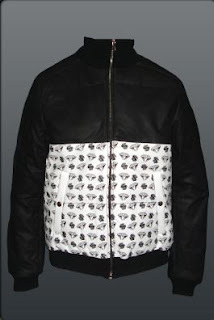 The leather bomber costs $1160.00. The cap is $75.00. 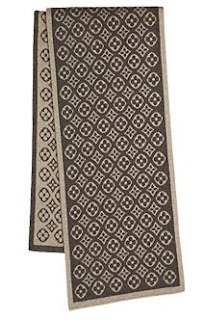 The Louis Vuitton cashmere scarf costs $695.00 available at eluxury.com. Zac Posen is posing and looking GREAT! Enough SAID!! Get an entire "new" spring look on Zappos Couture! Couture.Zappos.com is an online store that zappos.com created after they realized that they wanted to accomodate an additional market to their mass-market audience that zappos.com targets. Couture Zappos originally started out only offering high-end designer shoes of all kinds. Now that they have expanded into high-end apparel, handbags and accessories for women, men and children you can outfit your entire family on one-site. I have selected a complete woman's look for Couture Zappos, why don't you take a look. 1. Moschino red, popplin dress for Spring. Price - $291.00 2. Moschino white and blue cardigan with red accents. Perfect to be worn over the dress if it is chilly. Price - $395.00 3. 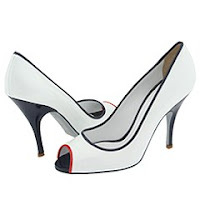 Dolce & Gabbana white with red and navy piping peep toe, pump with patent leather upper and a leather sole. Price - $398.95 4. 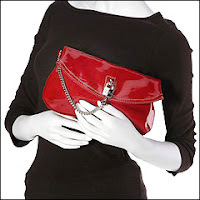 Dolce & Gabbana red, patent leather, clutch, with a chain link and a lock. 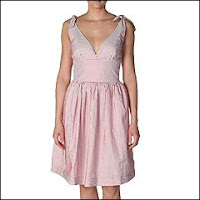 Price - $388.95 Check out Couture Zappos for more apparel, shoes, accessories and handbags that you may like. Shoe organization EXTRAORDINNAIRE - Shoe Pods and Shoe Wheels!! Rakku Designs, has designed an extraordinary shoe organizer. Can you believe a shoe pod and shoe wheel to hold your shoes in? It is unbelievable and not bad to look at either. 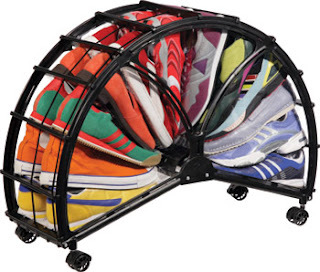 The shoe pod can hold up to 12 pairs of shoes in expandable pockets and the shoe wheel can hold up to 30 pairs. The shoe pod is priced at $32.50 and comes in black and silver. 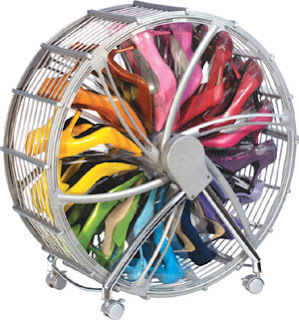 The shoe wheel is priced at $65.00 and comes in black, white, pink and silver. View the YouTube video on the demonstration of this wonderful invention. And stock up on these fabulous deals. Miss Davenporte's current take on a trapeze dress! OMG, thank goodness for Miss Davenporte who answered my fashion prayers with design of this dress. As women, we all know how comforting it "was" to be able to wear baby doll, bubble and trapeze style silhouettes and still be considered fashionable. I mean, honestly, no we all don't have perfect bodies, so I was very appreciative for having that trend. But now, I am so over that style in its literal sense. I mean, there are many opportunities and apparel lines out there that have more of it to come for Spring 2008, but for me, I'm looking for an equally as comfortable, chic, understated look, that I can add my personal flair to and be-FABULOUS! Miss Davenporte has done just that. 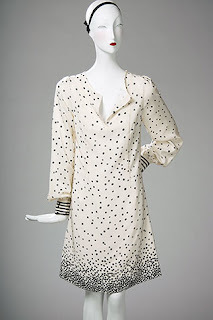 The dress is 100% silk, with black and white polka dotted print. Although it is long sleeve, the material is very lightweight therefore giving the cool factor for a mid-ranged temperature day. My favorite part about the dress is the shape. I mean, it's not trapeze and it's not baby doll, so when a belt is added to cinch the waist it will offer a fun, flavorful, style to the dress. The price is $600 and it is available on Ronherman.com. 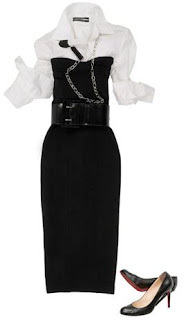 The belt is from bluefly.com and it is black, patent leather with studs and costs $29.00. I think wearing this belt with the dress will dress it down just a tad, for a modern edge. Add a punch to your work wardrobe with French Connection! French Connection is an apparel company based out of the UK that has sophisticated and modern clothing with a vibe and expression in classic silhouettes. I am very partial to apparel brands with such edge that can easily go from day to night; business meeting to business networking event; etc. 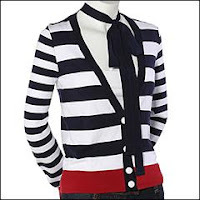 I believe that a lot of women need that kind of versatility in their wardrobe and French Connection can offer it to you. I have selected two pieces from their current online inventory that I think can add punch to your wardrobe for work and show that you have style and class when worn to social gatherings. First, is a classic trench coat. 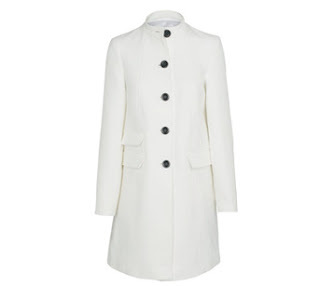 This coat is offered in white which is a popular color for the 2008 spring season. It's length is mid-thigh, but it is also light weight as it is made of 100% cotton. The cut is very feminine and it costs $298.00. 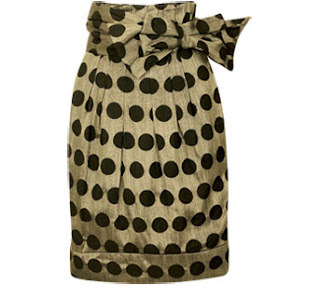 The next piece is a polka-dot designed gold with black dots, polyester and viscose skirt. The skirt is high waisted with a bow on the waist and has about a 2" hem along the bottom, giving it that classic, business savvy feeling. Price is $129.99 on Sale and it is adorable. The 2008 rendition of the Academy Awards showed nice dresses, in a very popular color (red) and a lot of people looked very well put together excluding many over the top looks from being the best dressed. Check out some of the red carpet looks that I liked this year. Photos courtesy wireimage.com Fashion notes: Marion Cotillard wore Jean Paul Gaultier, Jennifer Garner wore Oscar DeLa Renta and Hillary Swank wore Versace. There is a UK online retailer that I just LOOOVE and it is named Warehouse. But there is just one small problem, they do not SHIP to the US. No, really, I'm serious. Like when H&M was only in Europe and topshop was merely a store that we heard the celebrities shopped at. Well, last night I met two wonderful, young ladies from the UK and we discussed (of all things) fashion and they told me, (in a British accent) "we love Warehouse, but we just have our mums ship it to us." And I thought, hmmm, well I was thinking of doing that same thing by route of Tokyo, since I have a friend there (but does Warehouse even ship to Japan)? Then, I thought, oh now, I know, I can just ask their mum to do that for me too :-D Just kidding. But take a look at the fashions from this beloved site, that have price points of 30 - 90 British pounds and maybe you will see, why I am on a hunt to get it in the US. Also, check them out yourself online Warehouse.